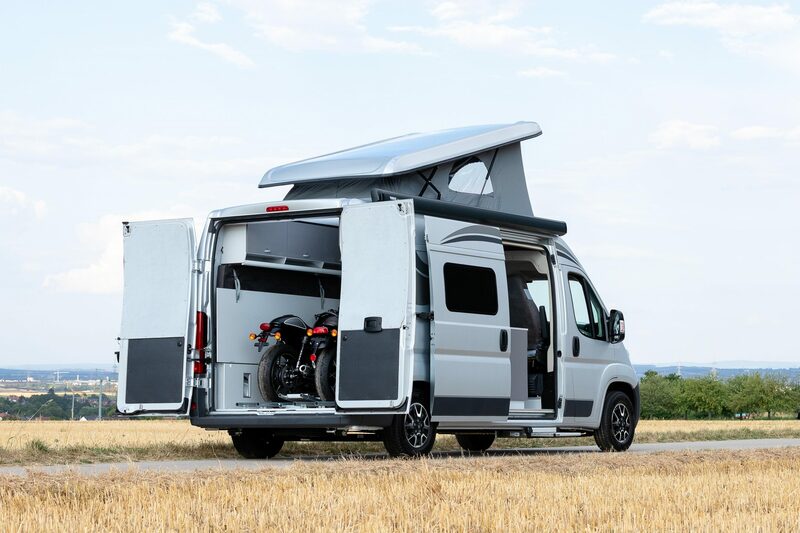 We’ve seen a recent trend in camper vans that can also accommodate motorbikes, combining the two worlds of camping and biking in ever more innovative ways, and Citroën is jumping right on board with their latest camper van offering. 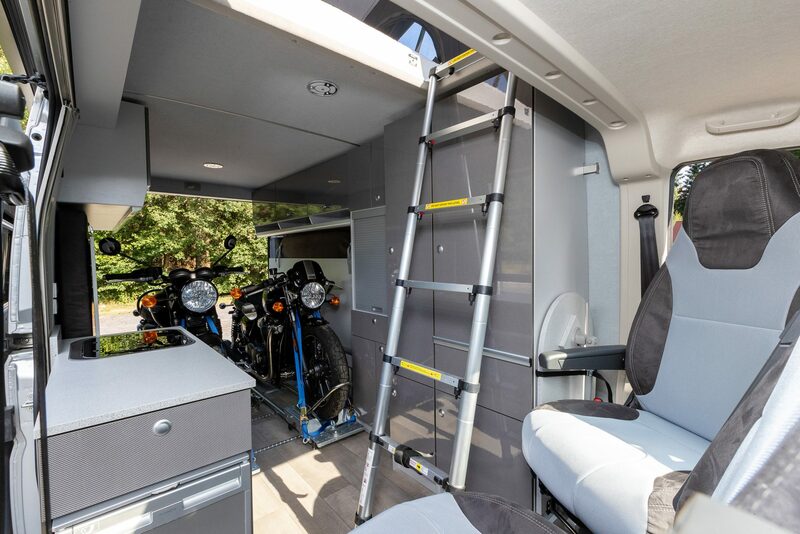 The aptly named “Biker Solution” offers a four bed, two seat camper with secure travel storage for two motorbikes, and within this, they have created a high-tech easy solution for loading bikes. 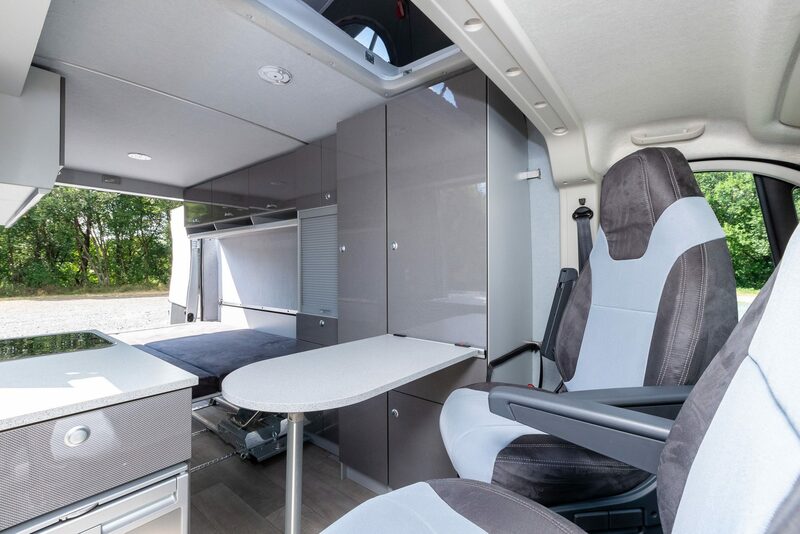 Its main competitor, the recently released Adria Twin Supreme, boasts a significantly larger living space, however, the Citroën Jumper is perfect for that ease of loading and unloading on track days and weekend getaways. When the motorbikes are removed the rear bed folds down for the night. 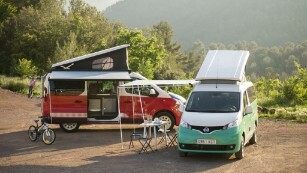 The conversion was created by German company Flexebu using their own patented designs to create a smart, modular camper van. The base van is a Citroën Jumper L3H2 BlueHDi delivering 157bhp and available only in aluminum grey. 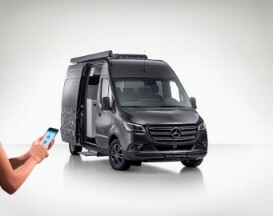 It comes packed with clever features including intelligent traction control, downhill and hill start assist, a video parking system, steering wheel remote control and a built-in SatNav. Its 6m long by 2.05m wide (19.7ft x 6.7ft) dimensions offer plenty of space for both living and transporting motorbikes while on the road. 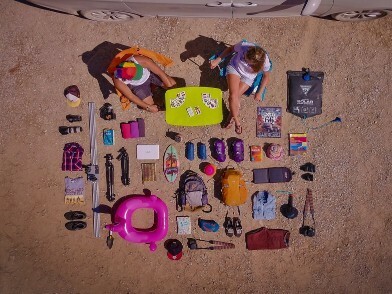 Two motorbikes can be loaded and transported in the rear of the camper. Two motorcycles can be loaded into the rear with the aid of front wheel mounting rail systems and an electric winch. 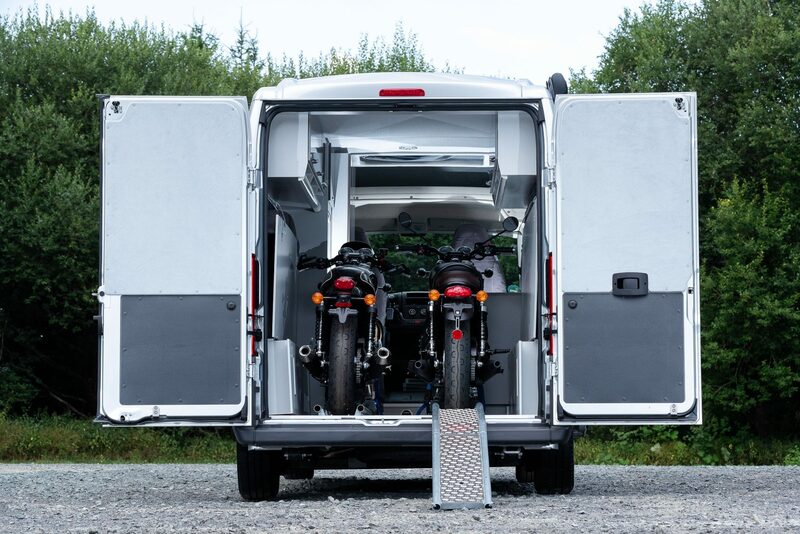 The additional ramp and the van’s low deck are also very helpful for loading the bikes with ease. Once inside there are numerous cupboards handy for storing helmets and motorbike gear as well as tools. 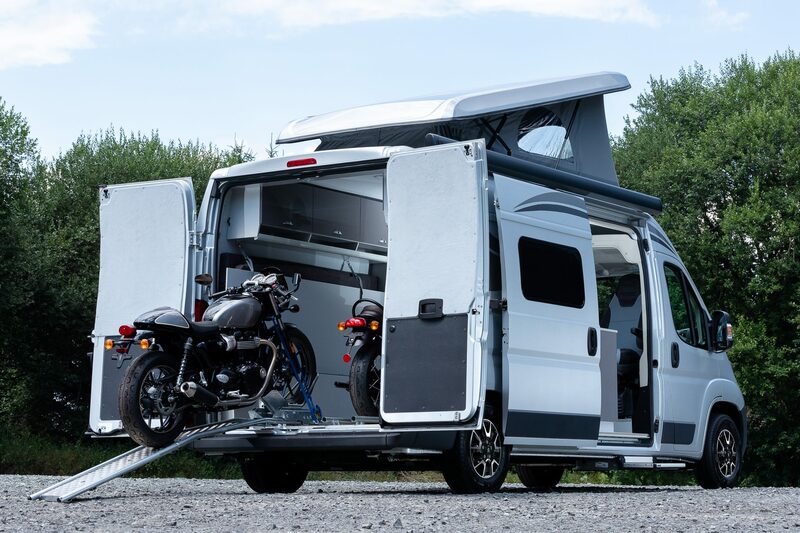 The cargo space is made possible with the installation of a side-folding double bed, which can be folded out at night once the bikes are removed. 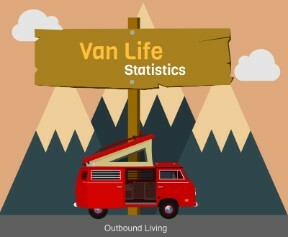 And for when you’re not camping and just need an everyday van for transporting cargo, it can even be transformed back into a regular van by removing the modular furniture via Flexebu’s patented clip system. Bikes can be easily loaded using the van’s electric winch and rail system. While the Biker Solution can sleep a total of four people, two in the rear bed and two in the pop top roof, it can only seat two passengers during transit. 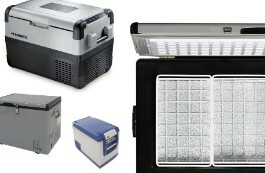 It has a removable dining table and swivel seats for two, and a tiny kitchen with a sink, compressor fridge and storage. It’s a camper van that’s certainly better suited to weekend riders, not full-timers, but it does feel surprisingly spacious inside. The Biker Solution’s fold-out bed and cozy dining area. The Biker Solution comes with a “maintenance-free” leisure battery and a Thule awning, as well as an all-over grey interior decor that Citroën claims to harmonize with the aluminum grey exterior. A little dull perhaps, but functional. The Citroën Jumper Biker Solution will be released in Europe for the starting price of €45,600 ($51,750), and is sure to be a valuable asset for bikers looking for an adventure or a weekend getaway at the track.